With e-sports gaining unprecedented momentum in the country and all over the world, (there’s actual talk about making this part of the Asian Games you know), what better time is there to equip yourself than the present? And with these two bad boys from Asus, whether you’re a MOBA strategist or an FPS gunslinger you’d definitely be rocking an edge with the refreshed Hero II and SCAR II. Apart from the obvious inclusion of the latest 8th Generation Intel Core i7s and a whopping 3ms refresh rate on the 144Hz screens, these two come in flavors specifically suited for the demand with a 1060 on the Hero II and a 1070 on the SCAR II. Keyboard highlights on the specific keys WASD and QWER are also present depending on the unit you own. The Hero II will sell for Php 104,995 and the SCAR II for Php 129,995 and is available right now at Asus ROG Concept Stores and Strongholds. More details after the jump. 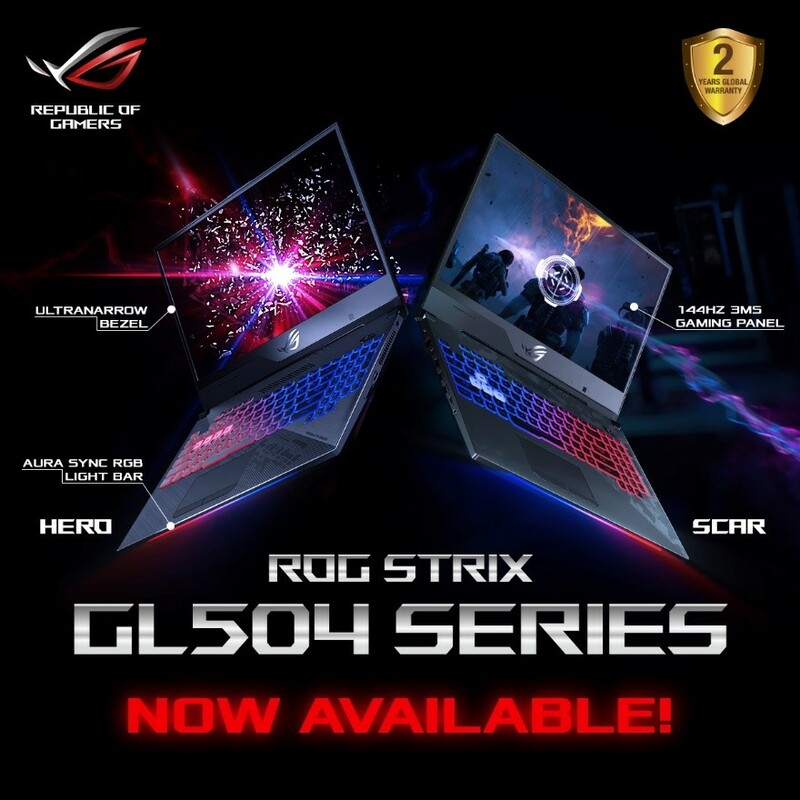 August 14,2018 – Members of the Republic now have a new reason to get into their games as ASUS Republic of Gamers announces the nationwide availability of the Strix GL504 SCAR II and Hero II gaming laptops. These powerful follow-ups to the highly successful esports-oriented gaming laptops feature a more compact design and a new front RGB light bar with customizable Aura Sync lighting. Both the SCAR II and Hero II laptops feature the world’s first 144Hz ultra-narrow-bezel display which allow for hyper-immersive visual performance. 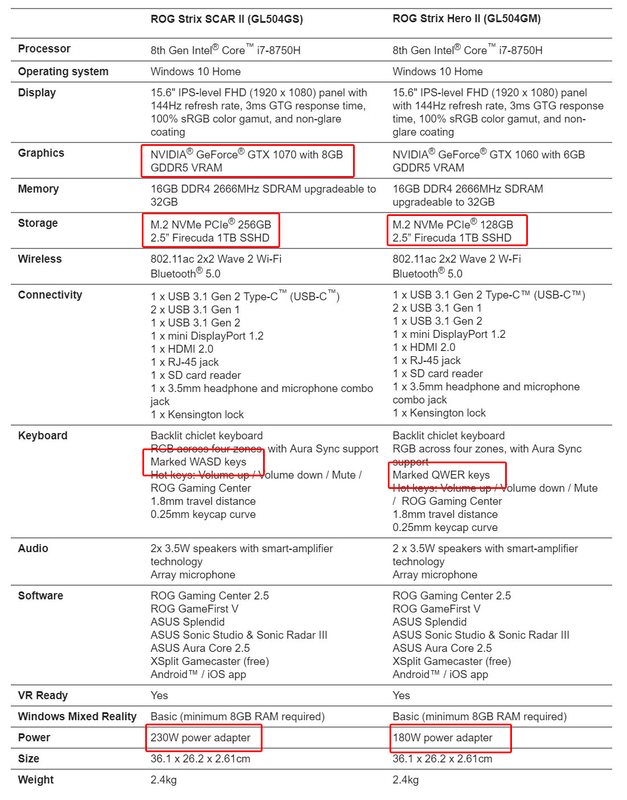 Both editions come with an 8th Generation Intel Core i7-8750H processor and 16GB of DDR4-2666MHz RAM. The Strix GL504 SCAR II comes with a 256GB NVMe PCIe SSD, a 2.5” Firecuda 1TB SSHD, NVIDIA GTX 1070 with 8GB GDDR5 VRAM, and will retail for PHP 129,995; while the Strix GL504 Hero II comes with a 128GB NVMe PCIe SSD, a 2.5” Firecuda 1TB SSHD, NVIDIA GTX 1060 with 6GB GDDR5 VRAM, and will go for PHP 104,995. The Strix GL504 gaming laptops will be available in ROG Strongholds and ASUS authorized resellers nationwide.